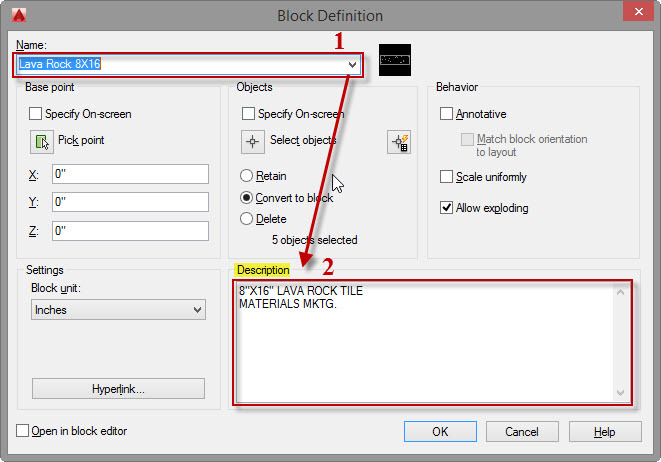 When you first create a block using the “BLOCK” command (B <enter>) you are given the option to enter a description of the block as shown below in the “Block Definition” dialog box. If you already have a block in-place in the drawing but do not have a block description, you can add it by using the command BMOD <enter> This will launch the Block definition dialog box as if you were creating a block. You can also get to this dialog box by simply entering B <enter> at the command line. Select the existing block’s name from the dropdown list. This entry was posted in AutoLISP, AutoLISP: Blocks, Blocks, Leaders, multileaders. Bookmark the permalink. – Make sure the “Specify On-screen” box is Unchecked. The ‘BDESC2ML’ command isn’t recognised and I am using AutoCAD 2016. Has this command been removed or goes by another name now? (princ (strcat "\nNo description for block: \""
"\nSpecify leader landing location: "
(prompt (strcat "\nNope, keep trying! " I can’t seem to use the ‘BDESC2ML’ command on AutoCAD 2016. Has the command been replaced with a new name or removed? That Command name is not a regular AutoCAD command. It refers to a command that a LISP routine (shown below) uses. hi great post – I tried loading in the lsp and using the command “BDESC2ML” but I get this message on the command bar – “error :no function definition AT:ENSEL” any tips on how to work arroerror :no function definition und this issue? The Lisp identifies the Block Description in the command line, but I can’t make it spit out the value on the Multileader. Any ideas on how to solve this?